Amelioration of non-wetting sands makes an enormous difference to the profitability of these sandplain soils and can also re-set the seed bank of herbicide resistant weeds to next to zero. SOME weed control strategies work well in a wide range of situations and some are more targeted. This is one of the targeted strategies, but it does have potential application on some five million hectares, or almost one-fifth, of Australia’s cropping land. Australian Herbicide Resistance Initiative (AHRI) western extension agronomist, Peter Newman, is an enthusiastic proponent of renovating non-wetting sands to ‘grow more crop and fewer weeds’. “The package that works best is controlled traffic farming plus soil inversion plus lime,” he said. “There is very solid proof that increasing the clay content in the topsoil, through mouldboard ploughing, spading or Plozza ploughing, improving pH and burying weed seed will have an enormous effect on farm profitability. 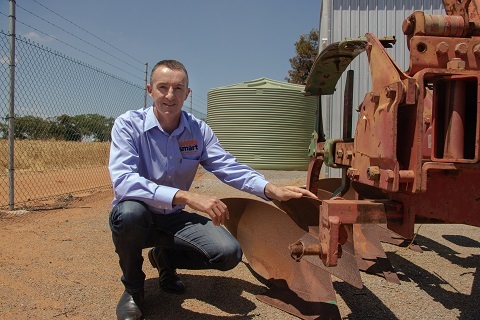 Australian Herbicide Resistance Initiative (AHRI) western extension agronomist, Peter Newman, says weed seed burial works best if the topsoil is fully inverted using a mouldboard plough and then left undisturbed indefinitely. It relies on the grower taking the opportunity to implement a robust integrated weed management program, such as the WeedSmart Big 6. Mr Newman said the research he and others had done over a period of more than a decade showed that for weed control, the mouldboard plough did the best job. Other claying options can be very effective and less time consuming if the weed burden is not excessive. “The results have consistently shown that mouldboard ploughing will bury 99 per cent of the weed seed and crops will respond with a large yield increase,” Mr Newman said. Most growers who have embarked on a renovation program on non-wetting sands return to a controlled traffic, zero-tillage farming system and expect to not ever have to repeat the operation. This leaves the herbicide resistant weeds safely buried and out of harm’s way. Having re-set the weed seed bank they are then able to concentrate their efforts on keeping weed numbers low – the very best way to avoid herbicide resistance. Is the full restoration process economically worthwhile on non-wetting sands? Longer answer: The change in water use efficiency is what drives the turn-around in profitability on this soil type. Growers can expect water use efficiency (WUE) to increase by about 40pc, so if the non-wetting sand is achieving a WUE of 12 kilograms/millimetre then crops grown after the renovation program will achieve WUE of around 16kg/mm. This jump in productivity makes a massive difference to profitability. 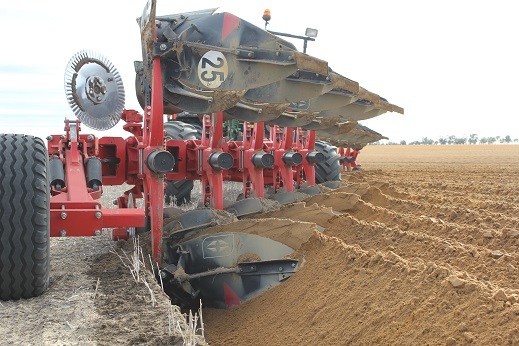 In round figures, the mouldboarding/spading operation costs $70/ha, deep ripping to 60cm depth costs $70/ha and 4t/ha of lime sand (spread) costs $100/ha (depending on location). Mouldboard ploughing (or spading) plus lime has been shown to achieve a return on investment of over 500pc over 10 years. An even higher return on investment can result if compacted soils are deep ripped. This return on investment justifies further investment in gear for controlled traffic farming (to avoid the future need to ameliorate compaction) and to implement a weed control program that relies less on herbicides. Does soil inversion affect herbicide use and efficacy? Short answer: It can. Growers need to be particularly careful with pre-emergent herbicide use for a few years. Longer answer: Following a renovation operation, additional care is needed to ensure crop safety in relation to pre-emergent herbicides. The reason for this is likely to be the increased wet-ability and the low organic matter in the ‘new’ topsoil, resulting in less binding of herbicide compared to the pre-renovation soil behaviour. Some growers avoid using pre-emergent herbicides for a year or two and re-introduce their use carefully. Trifluralin has been particularly damaging in some situations. Other growers have been able to continue using pre-emergent herbicides while paying particular attention to soil throw out of the furrow. On the flip side, weed control can improve following soil amelioration because the herbicides are now incorporated into wettable soil and weed seeds no longer get trapped in pockets of dry soil. Is the weed seed burial a weak link in this system? Short answer: Only if the sub-soil is disturbed again within five or six years. Longer answer: Non-wetting sands are prone to compaction and the alleviation of a hardpan contributes to the yield response that results from the full soil amelioration operation. In some instances, future deep ripping can bring buried weed seeds back to the soil surface. This is hard to avoid as the crop often responds favourably to deep ripping, so growers just need to be aware of the potential risk and plan their weed control accordingly. Once the weed seed bank is ‘re-set’, how do I stop weed blow-outs after ameliorating the soil? Short answer: Implement as many of the WeedSmart Big 6 tactics as you can. Longer answer: We know that herbicide-only weed control is no longer an option so it is essential to use a combination of herbicide and non-herbicide tools to stop seed set and keep weed numbers low. No matter what the soil type, you need to be doing some form of harvest weed seed control right now. There are a heap of options and some are very easy and relatively cheap to adopt. Following that you need to look at ways to increase crop competition and maximise the effectiveness of the herbicide options that are still available. Herbicide resistance can be beaten! ‘WeedSmart’ is an industry-led initiative that aims to enhance on-farm practices and promote the long term, sustainable use of herbicides in Australian agriculture.